Advances in Microbial Physiology is one of the most successful and prestigious series from Academic Press, an imprint of Elsevier. It publishes topical and important reviews, interpreting physiology to include all material that contributes to our understanding of how microorganisms and their component parts work. First published in 1967, it is now in its 59th volume. The Editors have always striven to interpret microbial physiology in the broadest context and have never restricted the contents to “traditional” views of whole cell physiology. 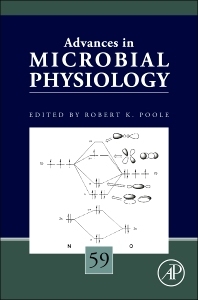 Now edited by Professor Robert Poole, University of Sheffield, Advances in Microbial Physiology continues to be an influential and very well reviewed series. Professor Robert Poole is West Riding Professor of Microbiology at the University of Sheffield. He has >35 years’ experience of bacterial physiology and bioenergetics, in particular O2-, CO- and NO-reactive proteins, and has published >300 papers (h=48, 2013). He was Chairman of the Plant and Microbial Sciences Committee of the UK Biotechnology and Biological Sciences Research Council and has held numerous grants from BBSRC, the Wellcome and Leverhulme Trusts and the EC. He coordinates an international SysMO systems biology consortium. He published pioneering studies of bacterial oxidases and globins and discovered the bacterial flavohaemoglobin gene (hmp) and its function in NO detoxification He recently published the first systems analyses of responses of bacteria to novel carbon monoxide-releasing molecules (CORMs) and is a world leader in NO, CO and CORM research.